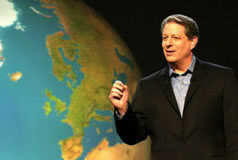 Al Gore out of hiding; blah, blah, blah.. again! Al Gore seems to be beating his drum again about climate change (old phrase “global warming”). He has come up with a new gimmick- campaign to “win the conversation.” Below see a 3 minute You Tube where he debates the idea that if you do not believe in the effects of global warming, you could be equated with a racist, and yet in the poorest of countries it is the black population who are starving due to the promotion of bio-fuels. This is an example of Hegelian Dialectic; “changing the conversation to “win” the conversation.” Simply put, the idea is to make one feel bad on some level for standing on principle, (God never runs out of resources to sustain man) so much so that one is defeated emotionally because no one else values your opinion or standard- therefore to be accepted, you acquiesce to the new idea. See Pink Apron Regiment You Tube on Hegelian Dialectic below. You may hear this new argument amongst sheeple who follow any liberal agenda that edges God out of the picture. Please remember, God hasn’t run out of anything and never will. This 15 minute You Tube will help explain what is going on in churches and socially around the world to get you to give up your standards and biblical principles for a counterfeit. This entry was posted on Monday, August 29th, 2011 at 3:47 pm	and posted in Uncategorized. You can follow any responses to this entry through the RSS 2.0 feed.